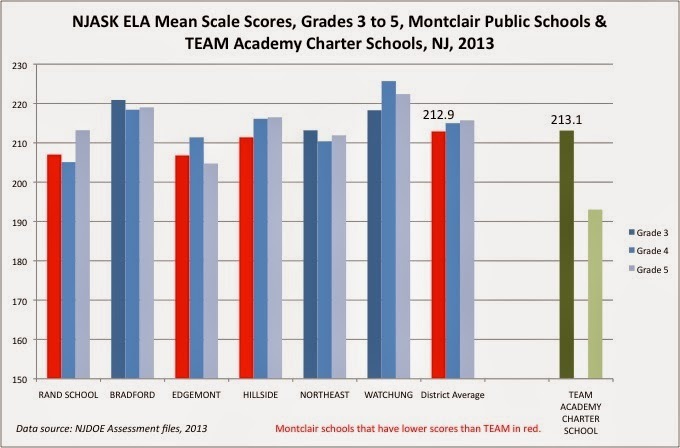 - TEAM Academy Charter School, the Newark branch of the nation charter chain KIPP, outscored the Montclair School District one year in one grade on one test -- by 0.2 scale score points. 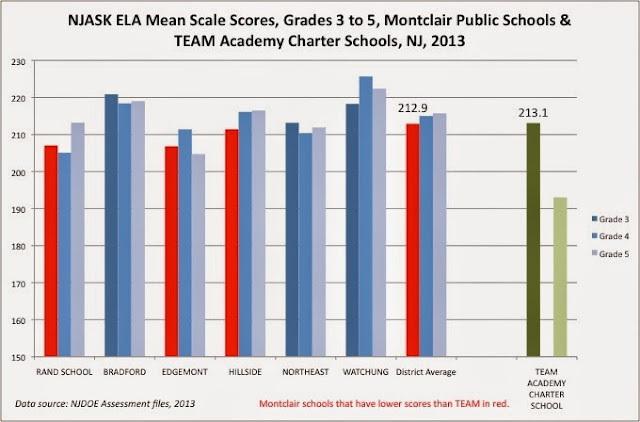 The next year, that same cohort of students, who were now in Grade 4, showed substantially different results on the same test; the Montclair average was now substantially higher than TEAM/KIPP's. 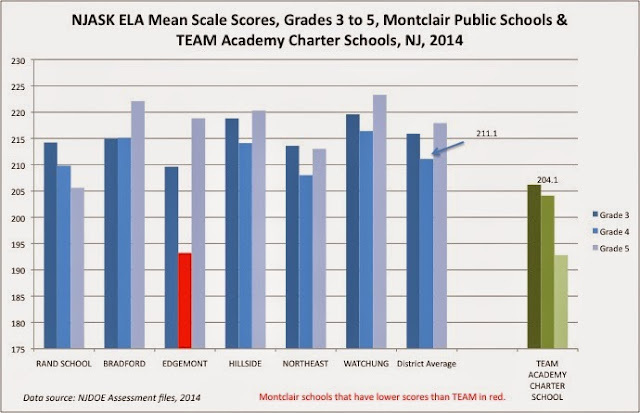 I don't point this out to suggest either that Montclair's schools are superior, or that TEAM/KIPP's schools are inferior. 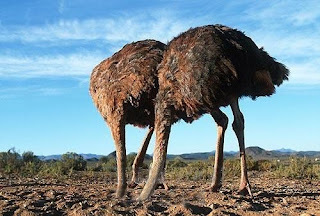 Without adequately controlling for at least the observed variations in each district's populations (and acknowledging that there are likely many unobserved variations), any comparison between the two systems is utterly pointless. My point here is that facile, a-contextual, cherry-picked factoids like these are completely meaningless, and that people who bring them up time and again show themselves to be fatuous. - The latest official figures for TEAM/KIPP's post-secondary (college) enrollment rate is 82 percent. I think this is very good and TEAM/KIPP should be proud of their work; however, once again, it is pointless to say that TEAM/KIPP is getting far superior results than the district schools unless and until you account for the differences, both reported and unreported, in the student populations. Further, simply citing one year's post-enrollment rate, which has not even been confirmed by official sources, is at best incomplete and at worst just plain old lazy. First of all, there is nothing in here about TEAM/KIPP. Second, the claim of $1,200 per year at BRICK, an NPS school, is unsourced. My review of NPS data calls into question the veracity of the claim; NPS documents showed spending of about $225 per pupil on custodial salaries (see my brief for the data source). Finally, there is no documentation of how Lee calculated her figure, or what the "private market" means. I think I've been more than fair to Russakoff, but I also think it's simply unacceptable for "facts" like these to work their way into the mainstream media. She has actually misquoted her own book in interviews. It's important to be clear and rigorous with this stuff; I have found Russakoff's use of data in The Prize to be neither. Sorry to be blunt, but enough's enough. 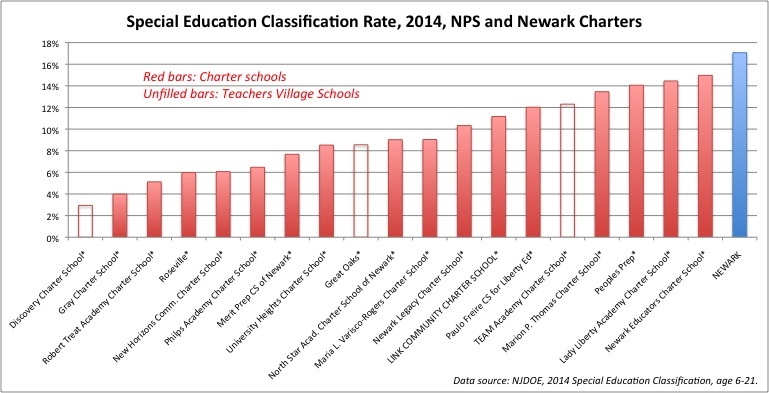 - The notion that Newark's charters have less bureaucratic bloat than NPS schools is contradicted by state data. 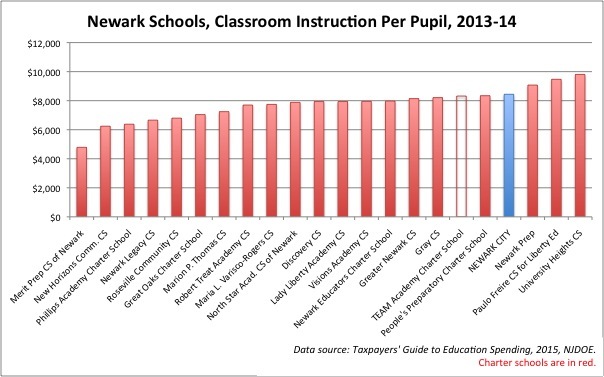 Newark spends more on classroom instruction per pupil than most Newark charters, including TEAM/KIPP. 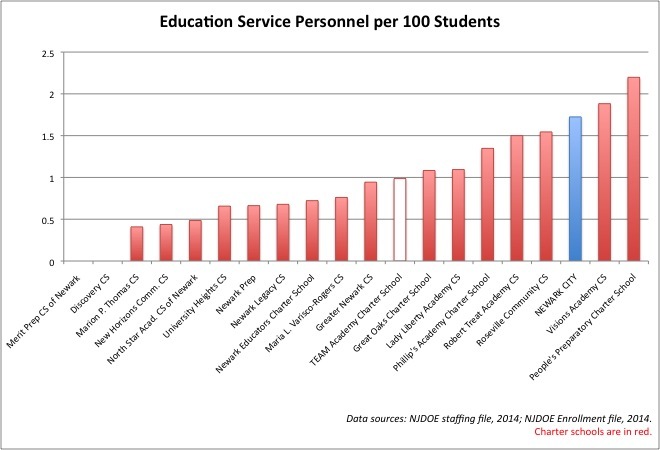 NPS spends far more on student support services -- guidance counselors, nurses, librarians, psychologists -- than the charters. 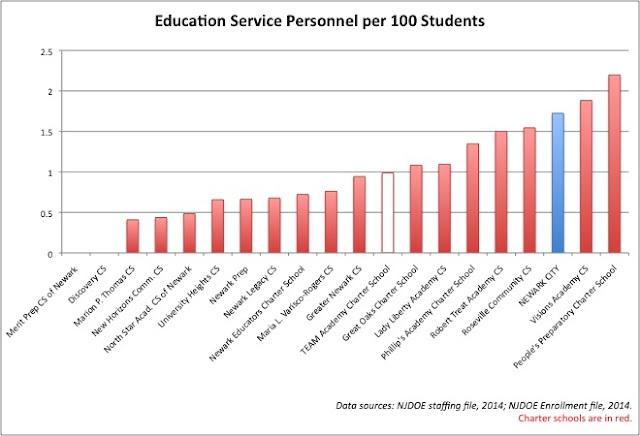 This is reflected in the large number of these support personnel per student at NPS compared to most charters. 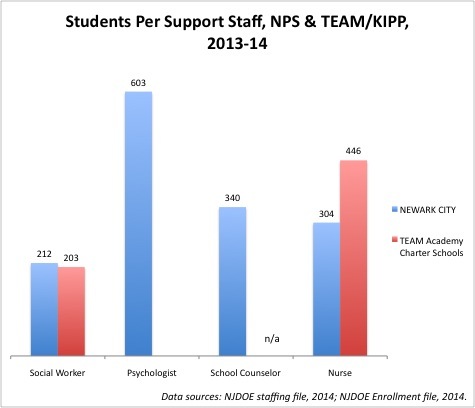 While TEAM/KIPP has equivalent numbers of social workers per student compared to NPS, the district also has many more psychologists, school counselors, and nurses per student. 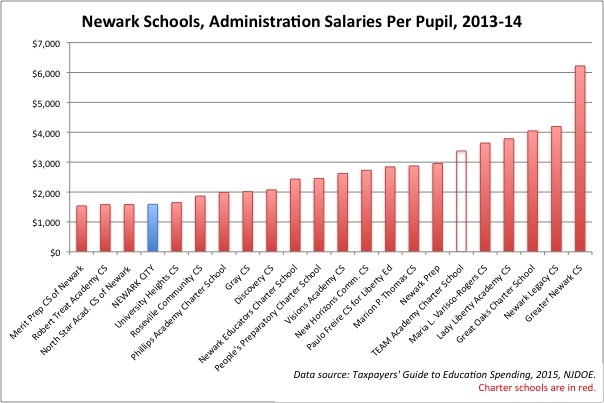 NPS has lower administration costs per pupil than any Newark charter school. NPS's administrative salary costs are among the lowest in the city. Despite having a crumbling infrastructure, NPS plant costs are not inordinately high compared to the charters. Russakoff has claimed that only half the money spent by NPS makes it "into the classroom." Yet she never explains what that means, she never explains her methodology for arriving at the figure, and she never fully sources the figure. In the face of all this contradicting evidence that comes directly from the state, Russakoff and the people who quote her have an obligation to explain the apparent contradiction here. Is the state data wrong? If so, how do we know? You can't just fling data around without explaining how it was created, where you got it, and how it should be interpreted in the proper context. I'm tired of hectoring people who clearly don't give a damn about their own reputations. But I'm not going to stop pointing out when claims are made about schools that have no proper context, are cherry-picked, are poorly sourced, or are just plain wrong. What I have above are the facts. You can check them out yourself. If I'm wrong, I'll correct them. You can't argue with people who repeatedly bury their heads in the sand. All you can do is point out the facts to those who are willing to listen. OD: Of course the district should undergo the “forensic audit” that Russakoff suggests. More money should be going to the children in the classrooms, especially when that means more social workers, counselors, teachers assistants, etc. But it has to be understood w/in the context of a depressed local economy where middle class jobs are scarce. Again: Russakoff's tale is contradicted by official state data. Further, she has absolutely not made the case that her sources are better than the state's own reporting. This has got to stop. We are telling the wrong story, and it's going to lead us to the wrong conclusions. 1) Lately, the posts are longer and much more likely to be filled with statistical stuff. 2) I've had it with arguing with reformy hacks. As I said before: the reformy side really has nothing. If the best response you have to charter skepticism -- which is not, by the way, the same as saying there is no place for choice or charter schools in our education system; it's actually saying that the claims of vastly superior results in the charter sector are largely nonsense -- is to make thinly veiled accusations of racism, you're really running on fumes. If the best response you have to the legitimate concerns of parents who, among other actions, opt their children out of standardized tests is to say that they are merely coddling their kids, you really have nothing to contribute to the conversation about America's schools. If you spend your days beating up teachers unions while ignoring the serious problem of inadequate and inequitable funding for our schools, you're not someone I want to waste my time on. So this blog is, I hope, entering a new phase. Or maybe it's more accurate to say I'm going to try to spend more time writing things I myself would like to read: evidence-based, rigorous, serious discussions about American education, using publicly available data and other forms of evidence to fight off the tired, ignorant platitudes that have come to dominate the conversations about this nation's schools. Reformsters: if you want to "swarm" me while I do this, go ahead. At this point, I really couldn't care less. I am not going to waste my time debating you on your facile meandering. If you want me to engage, step up; otherwise, you're just not worth it. In the spring of last year, nj.com posted a story about the PARCC exam -- the new, semi-national standardized test that has been a large source of controversy -- and how it would affect teacher evaluations in the state. I happened to notice a really great comment from "Rutgers Professor" just below the article. The scholar in question is Gerald A. Goldin. I don't know him personally, but I had certainly heard about him: he is the definition of a scholar, distinguished in both his field and the teaching of his field. It bothered me, frankly, that someone as knowledgable as Goldin, who had written a genuine essay within his comment, wasn't featured more prominently in this post. Since I'm at Rutgers myself, I contacted him to ask if I could publish what he wrote. I didn't hear back from him until later in the fall; he was away, and then I was away, and you know how that goes. Dr, Goldin, however, was very gracious and agreed to let me reprint what he wrote. I only apologize I haven't done so until now. What you're about to read is important; Gerald Goldin's opinion on how PARCC will be used matters. I know the state has dropped the percentage of SGP used in a teacher's total evaluation to 10 percent, but even that's too much for a method that is fundamentally invalid. I'm honored to host this essay on my blog. Thanks, Dr. Goldin, for this contribution. I read with interest the on-line article (March 16, 2015), “7 things to know about PARCC’s effect on teacher evaluations” at www.nj.com/education/. As a mathematical scientist with knowledge of modeling, of statistics, and of mathematics education research, I am persuaded that what we see here could fairly be termed "junk statistics" -- numbers without meaning or significance, dressing up the evaluation process with the illusion of rigor in a way that can only serve to deceive the public. 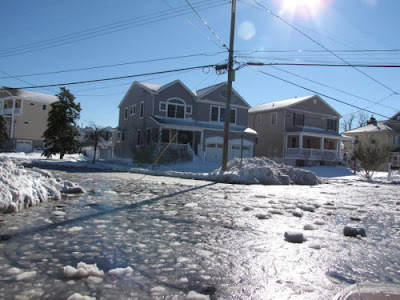 Most New Jersey parents and other residents do not have the level of technical mathematical understanding that would enable them to see through such a pseudoscientific numbers game. It is not especailly reassuring that only 10% of the evaluation of teachers will be based on such numbers this year, 20% next year, or that a teacher can only be fired based on two year’ s data. Pseudoscience deserves no weight whatsoever in educational policy. It is immensely troubling that things have reached this point in New Jersey. I have not examined the specific plans for using PARCC data directly, but am basing this note on the information in the article. Some of the more detailed reasons for my opinion are provided in a separate comment. In short, I think the 8th thing to know about PARCC’s effect on teacher evaluation is that the public is being conned by junk statistics. The adverse effects on our children’s education are immediate. This planned misuse of test results influences both teachers and children. First, of course, we have the “scale error” of measurement in each of the two tests (PARCC and NJ-ASK). Second, we have random error of measurement in each of the two tests, including the effects of all the uncontrollable variables on each student’s performance on any given day, resulting in inattention, misreading of a question, “careless mistakes,” etc. Third, we have any systematic error of measurement – possibly understating or overstating student competency – that may be present in the test instruments, may be different in the two instruments, and may vary across the test scales. The magnitude of each of these sources of error is about doubled when the difference of two independently-obtained scores is taken, as it is in calcualting the gain score. In addition, since two different test instruments are being used in the calculation, taking the difference of the scores requires some derived scale not specified in the article, which can introduce additional error. These sources of error mean that each student's individual gain score has a wide "error bar" as a measure of whatever it is that each test is designed to measure. Fourth, we have “threshold effects” – some students are advanced well beyond the content intended to be measured by each test, while others are far behind in their knowledge of that content. The threshold effects contribute to contaminating the data with scores that are not applicable at all. Note that while the scores of such students may be extremely high or low, their difference from one year to the next may not to be extreme at all. Thus they can contribute importantly in calculating a median (see below). A fifth effect results from students who did not take one of the two tests. Their gain scores cannot be calculated, and consequently some fraction of each teacher’s class will be omitted from the data. This may or may not occur randomly, and in any case it contributes to the questionability of the results. Sixth is the fact that many variables other than the teacher influence test performance – parents’ level of education, socioeconomic variables, effects of prior schooling, community of residence, and so forth. Sophisticated statistical methods sometimes used to “factor out” such effects (so-called “value added modeling”) introduce so much additional randomness that no teacher’s class comes close in size to being a statistically significant sample. But without the use of such methods, one cannot properly attribute “academic growth” or its absence to the teacher. According to the description in the article, the student gain scores are then converted to a percentile scale ranging from 0 to 100, by comparison with other students having "similar academic histories." 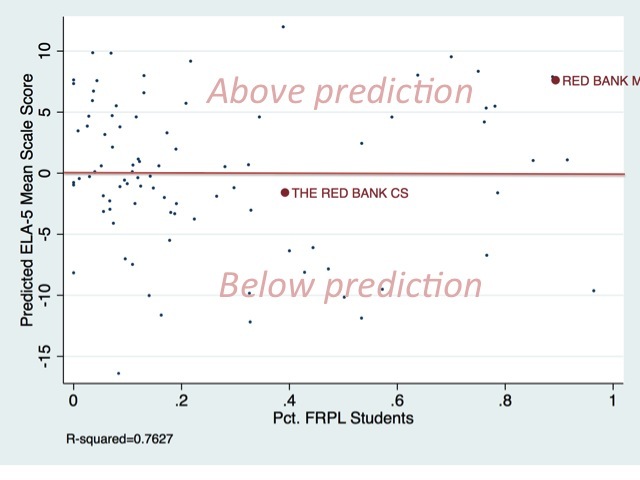 It is not clear to me whether this means simply comparison with all those having taking both tests at the same grade level, or also means possibly stratifying with respect to other, socioeconomic variables (such as district factor groupings) in calculating the percentiles. 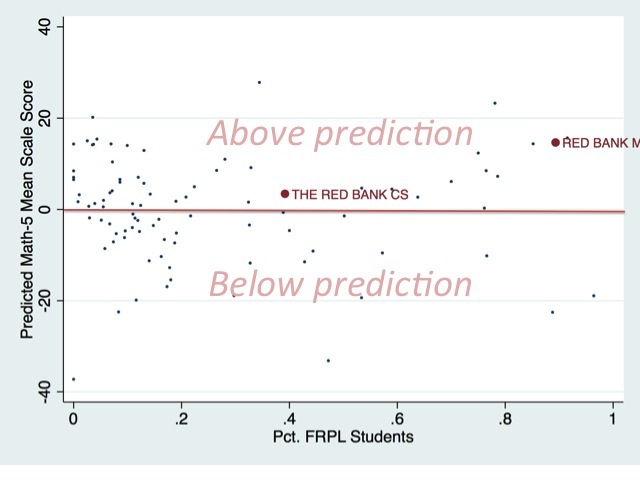 Then the median of these percentile scores is found across the teacher’s class. Finally the median percentile of gain scores is converted to a scale of 1-4; it not specified whether one merely divdes by 25, or some other method is used. However, a seventh objection is that test scores, and consequently gain scores, are typically distributed according to a bell-shaped curve (that is, approximately a normal distribution). Percentile scores, on the other hand, form a level distribution (that is, they are uniformly distributed form 0 to 99). This artificially magnifies the scale toward the center of the bell-shaped distribution, and diminishes it at the tails. Small absolute differences in gain scores near the mean gain score result in important percentile differences, while large absolute differences in gain scores near the extremes result in small percentile differences. There are more complications. The distribution of performance on one or both tests may be skewed (this called kurtosis), so that it is not a symmetrical bell-shaped curve. How wide the distribution of scores is (the “sample standard deviation”) is very important, but does not seem to have been taken into account explicitly. Sometimes this is done in establishing the scales for reporting scores, in which case one thereby introduces an additional source of random error into the derived score, particularly when distributions are skewed. Eighth, and perhaps most tellingly, the median score as a measure of central tendency is entirely insensitve to the distribution of scores above and below it. A teacher of 25 students with a median “academic growth” score of 40 might have as many as 12 students with academic growth scores over 90, or not a single student with an academic growth score above 45. To use the same statistic in both cases is patently absurd. These comments do not address the validity of the tests, which some others have criticized. They pertain to the statistics of interpreting the results. The teacher evaluation scores that will be derived from the PARCC test will tell us nothing whatsoever about teaching quality. But their use tells us a lot about the quality of the educational policies being pursued in New Jersey and, more generally, the United States. @jerseyjazzman @The74 Few data points? 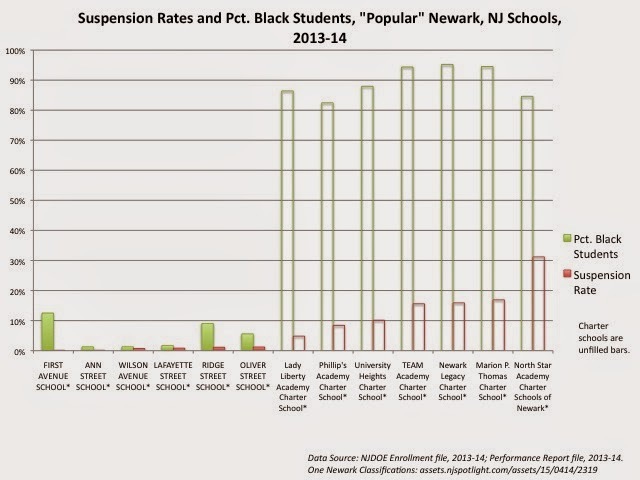 So when NJ releases parcc and Alexander scores right, will look for a retraction. Um, no. 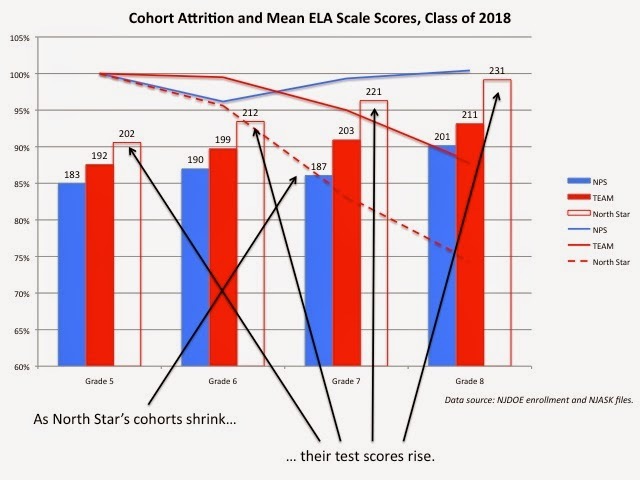 As you will read below, unless NJDOE changes how it does business, we'll never see what Alexander's score on the PARCC was in the official state data, because North Star's results are published in the aggregate: we only get results for all of North Star's schools together, and not the individual schools in their system. 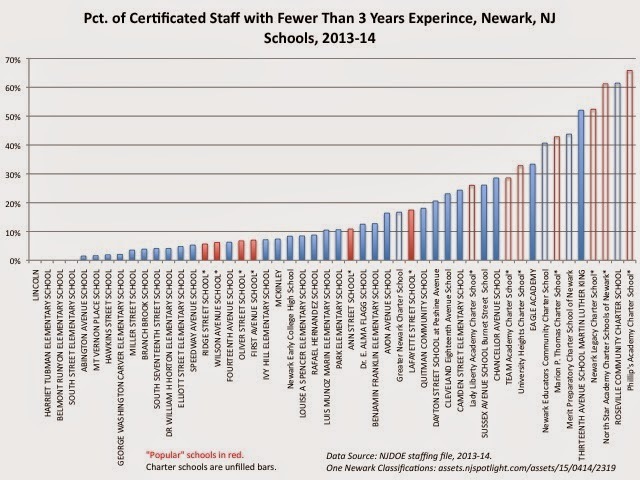 I actually wonder how North Star was able to separate Alexander from its other schools; does NJDOE have school-level data for charter chains? If yes, why don't they release those figures publicly? And release the special education and student demographic and suspension rates and all the other breakdowns by school as well? More and better data -- please. But a steady drip of recent data points to a very different story line: Not only did the reforms of traditional Newark Public Schools produce some real benefits, but the relatively small portion of the gift invested in Newark charter schools paid off big. Real big. Whitmire gives three citations to back up his claim that Newark's schools produced "real gains." Of course, all are from -- surprise! -- The 74: one from a spokesman for KIPP, the largest chain chain in Newark; one from current State Superintendent Chris Cerf, who, when he was the state education commissioner, was former State Superintendent Cami Anderson's biggest supporter; and one from Anderson herself. All trot out data points to make their case; unfortunately, none account for what quantitative researchers often call secular effects: changes that affect the entire system being studied. In other words, if Newark's test scores rose as part of a statewide rise in scores, that really doesn't make the case that Newark's reforms had any direct, causal effect. Bruce Baker and I looked at Newark's test scores -- both charters and NPS -- over the period of "reform" in the city's schools. 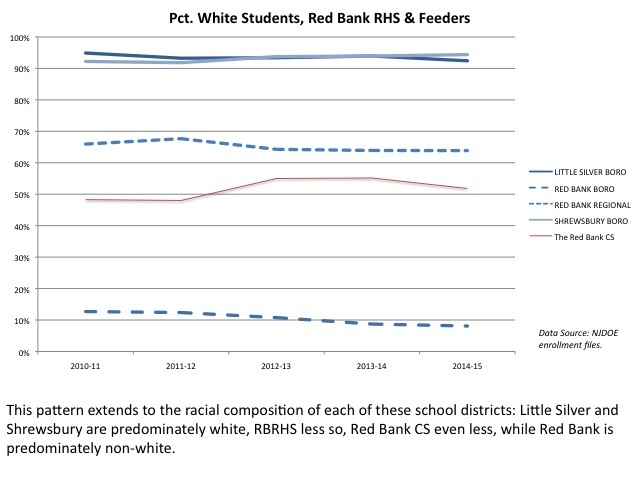 We found no evidence that Newark has seen any positive changes that couldn't be explained by overall, statewide trends (I'll have a similar analysis of graduation rates out soon). So when Whitmire says NPS reforms produced "some real benefits," understand he is making a claim that is supported only be the weakest of evidence, and is based on data points from directly interested parties. Does anyone think that's enough to make a suggestion like this? 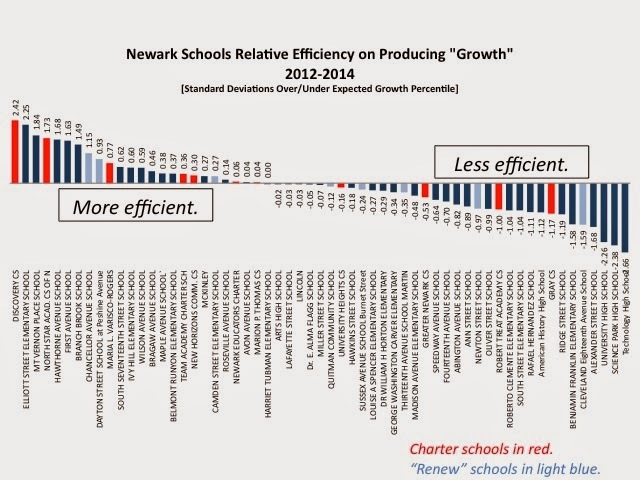 The gains are so striking, in fact, that they raise a key question: Why didn’t the Newark reforms emphasize charters from the beginning? If you look across the Hudson River where former New York City schools chancellor Joel Klein produced striking gains by pulling in the region’s top charters with offers of $1 a year rentals to use existing buildings, it’s reasonable to ask (with the admitted benefit of hindsight): Why didn’t Newark do the same? First of all, as Leonie Haimson among others has shown, the Klein era was hardly an undeniable success. In addition, it's worth pointing out that there is a good argument to be made that NPS would have been better off not selling off properties like 18th Avenue School to private owners. Not only did NPS arguably not get fair market value for the property; as (again) Bruce Baker and Gary Miron point out, the taxpayers are paying to buy a property they already own and turn it over to private ownership. OK, hold on -- Richard, you're going to base your case on data that is not publicly available, cannot be verified, and comes straight from an interested party? That's your evidence? Because you can't make the claim that test scores show any school is "succeeding" without accounting for differences in its student populations. Whitmire thinks it's enough to simply show the state average proficiency rates for "non-economically disadvantaged" students and compare them to North Star/Alexander's. But that's wholly inadequate: what about differences in the populations of special education and Limited English Proficient students? What about the differences in the types of learning disabilities? 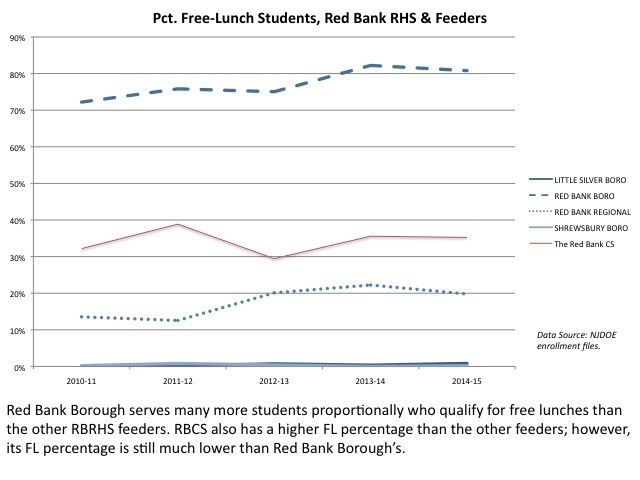 What about the differences between free lunch-eligible and reduced price lunch-eligible students, which I've shown can significantly affect test scores? North Star has a relatively small FL population, even compared to many other Newark charter chains. From my posts on Teachers Village: North Star enrolls far fewer special education students proportionally than NPS. Also from the Teachers Village series: North Star enrolls not even one LEP student. 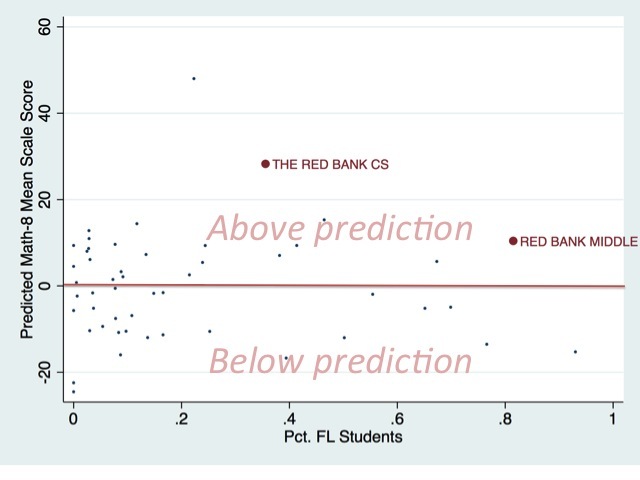 The methodology was (again) developed by Bruce Baker to control for differences in student characteristics, spending, class sizes, and other school variations, and then compare adjusted growth percentiles. Let's be fair: North Star is one of the more "efficient" schools in Newark. But several other schools, including NPS schools, are equally or more efficient. 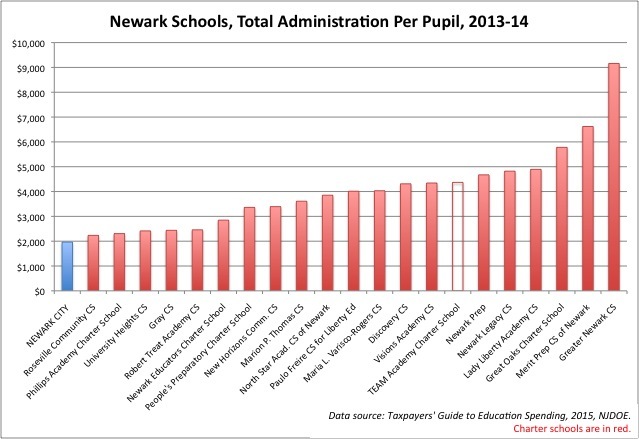 Further, many Newark charters are relatively inefficient. Where is there any proof a mass conversion of NPS schools to charters will substantively change student outcomes for the better? When North Star took over Alexander, they cut the Grade 5 through Grade 8 students loose. I ask all of you who thunder that we cannot tolerate any delays in charter school conversions: if it was so important for Alexander's students to be enrolled in a charter like North Star, why didn't Cami Anderson force the charter to take all of the students enrolled there? Again, from my testimony before the Joint Committee on the Public Schools. 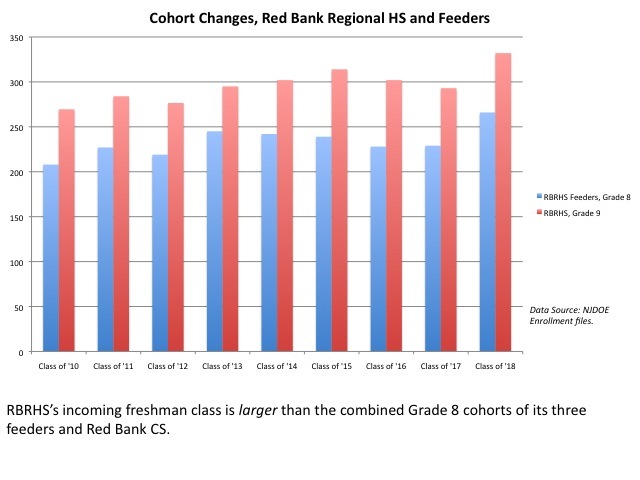 Here's how the Class of 2018 shrank during their Grade 5 through Grade 8 years at North Star -- all while their scale scores on the NJASK went up. Did Whitmire ever bother to ask about this? Unless and until the state-run NPS district releases publicly available and vetted data, we will never know how many students actually stayed when Alexander converted. 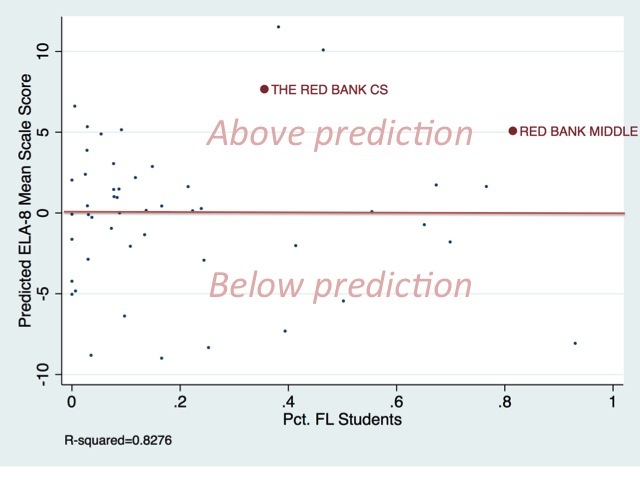 We will never know if the proportion of FL or special education students changed, because NJDOE only requires charters to report student demographics aggregated across their entire network. And, perhaps most importantly: unless and until someone actually goes into North Star and carefully vets the school's practices, we will never really know if there are unobserved differences between North Star students and NPS students. 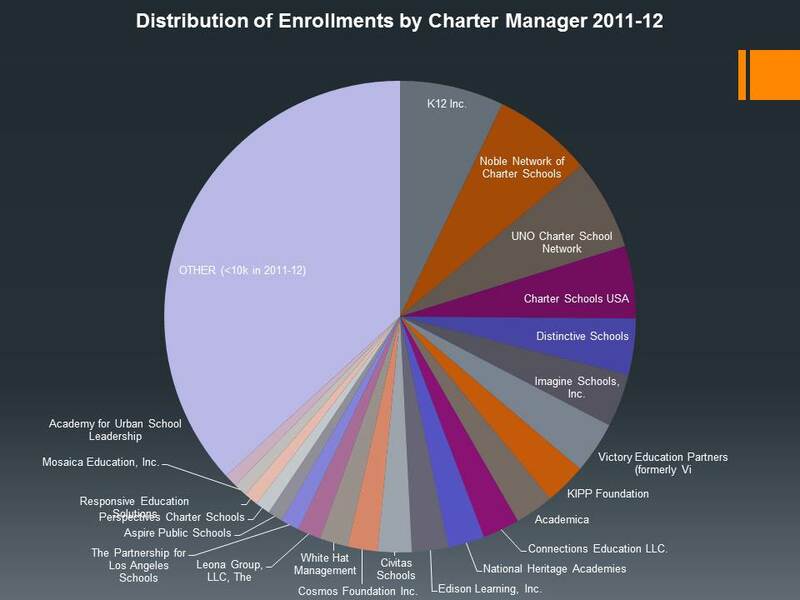 I get the sense sometimes that people think charter schools are a recent phenomenon. But North Star has been around since 1997; it's hardly new. According to many charter advocates, students and families learn from each other how charters differ not only from the public schools, but from other charters. I agree; I think the word most certainly has gone out about what kind of school North Star is. North Star's certificated staff is one of the least experienced faculties in the city. Yes, I do think many parents know these facts, and I do think they can influence their choices. I think many parents hear that North Star is a "no excuses" charter with fewer highly experienced educators than NPS, and they think: "Is this school going to be good fit for my child?" And then they act accordingly. I am always amazed at charter advocates who can't follow through this rather simple line of reasoning -- one based on premises they all accept. If parents are going to "choose" their child's school, why would we be at all surprised that the children who enroll in a school like North Star differ from those who enroll in an NPS school -- even in ways that do not show up in state data? Why would we think the children in "no excuses" charters are just like the children who are in other schools? Again, a "choice" system is predicated on families being informed consumers; of being able to access more information than the poorly-constructed measures of school effectiveness put out by clearly biased governmental entities. If we believe this, than of course the students at North Star will take to a "no excuses" model of schooling better than the entire student population. Of course many students at North Star will leave after their families discover the school isn't the right "fit." I honestly do not understand why any charter advocate would ever try to argue otherwise. Again, let me be fair: North Star is a school that generally outperforms on test-based measures given its student population. Good for them; they should be proud of that. But there is no evidence the "successes" of North Star can be significantly scaled up. North Star may work for the students who stay there, but there is no evidence it will work for all students; in my opinion, there's no evidence it will work for many of Newark's students, particularly give Uncommon's rather questionable pedagogical methods. In addition: we are seeing more and more evidence that Newark's school funding system must change, or charter school proliferation will become an increasingly destructive force for the many students who, by choice, remain enrolled in NPS schools. That cannot be allowed to continue; it's completely unfair and it will rip the city apart. 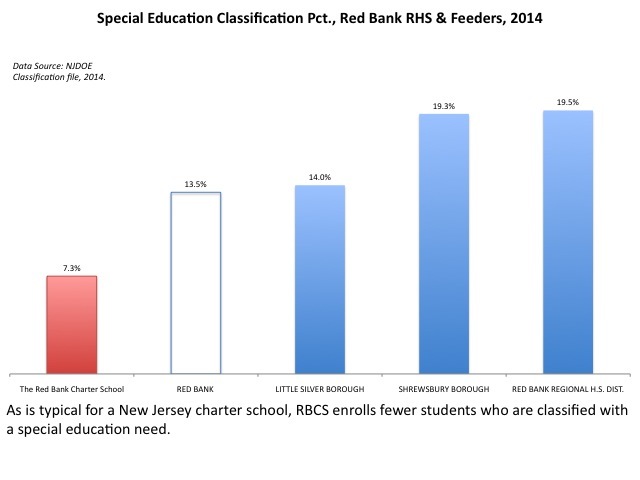 Full funding of all Newark schools is a necessary precondition for the expansion of charters. That claim is simply not supported by the evidence. I don't care what Dale Russakoff's book says, there is no evidence Newark's charters are lean and mean while NPS is full of bloat. I have repeatedly backed up my position on this with a slew of data; where's Whitmire's? - Yes, charter parents deserve a voice in how schools are structured. But so do the parents and students who advocate for NPS schools -- families whose voices are repeatedly marginalized or flat-out ignored. - Market-based school "choice" is not the same as democratic self-governance. Newark parents should not have to settle for "voting with their feet"; like suburban parents, they should be able to vote with their vote. - If the Newark community wants to have schools with differing discipline codes, so be it. But parents should not have to enroll their children in schools that abrogate their rights simply to get them into schools that aren't crumbling and dangerous. What @rpondiscio says: http://bit.ly/1l7mkG6 . When someone cites only hs grad stats, as in @DavidKirp/ NYT op-ed, u know something fishy. I'll be the first to agree that Kirp's argument was missing some key context. But Whitmire's propaganda here -- yes, let's call it what it is -- is, in my opinion, even worse. 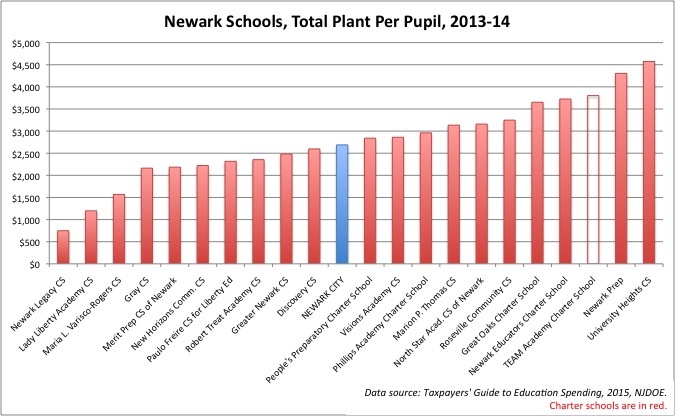 A few carefully selected data points that can't be verified and that come from an interested party do not add up to evidence for the radical remaking of Newark's schools that Richard Whitmire desires. It's fine for charter schools to be proud of their work. But ideological charter cheerleading does not help anyone. Enough, please. Can you address the best way for students to research colleges -- resources, criteria, or do's and don'ts? Well, if that's true for college, isn't it just as true for K-12 schools? Isn't that the entire point of the school "choice" movement: that some schools aren't always a good "fit" for everyone? And if that's true, why should we believe North Star's methods will work for all children? As always: Bruce Baker is my advisor in the PhD program at Rutgers GSE.